Kogoruhn is an ancient Dunmer stronghold, the location of which was lost with time. It is in the far northern Ashlands, southeast of the Urshilaku Camp, and due east of Falasmaryon. Kogoruhn, whose name means "Unbreakable Home", is the lost stronghold of the Sixth House. Its Propylon chamber no longer functions, and long ago, after the fall of House Dagoth, it was taken off the propylon transport route. It lies in ruin, and its location is generally forgotten. 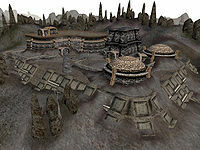 The stronghold may seem akin to the other ancient Dunmer fortresses scattered around Vvardenfell, but is in fact much more dangerous, as it is inhabited by a variety of both leveled and set ash creatures and daedra. Outside of Ghostfence, it is the primary Sixth House base, and also features extensive tunnels under the stronghold, with connections inside the Ghostfence just to the east of Vemynal. The stronghold contains some very valuable items, some of which are required for the main quest. The Halls hold relics of House Dagoth, as well as fallen adventurers, one of whom carries the unique claymore Fury and an incomplete set of glass armor. There is also a glass halberd beside the table near the dead adventurer. A dead Khajiit in a nearby cell is carrying an ebony shortsword. 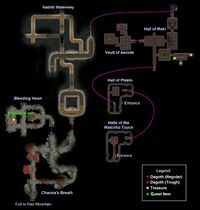 Other notable items are a Sixth House Bell Hammer in the Temple of Fey, an ebony spear sticking from a desk in the Hall of the Watchful Touch, and a dwarven mace lying on a crate in the Nabith Waterway. Finally, in the Bleeding Heart section you can find a pair of daedric gauntlets, an Orcish warhammer, and the Shadow Shield, which you will need to acquire to complete the Path of the Incarnate. † Dagoth Baler is unique among ash ghouls in that he actually is considered undead by the game; for example Turn Undead spells will work on him. Note: All unique creatures in Kogoruhn have an Alarm stat of 0, and a Fight stat of 90. In the Dome of Pollock's Eve there is "THE DREAMER IS AWAKE" written on the floor using blood red daedric letters. The same phrase is found in the Dome of Urso, but it is written with the Latin alphabet. In the Vault of Aerode, in a room with a bonelord, there is a House Dagoth symbol drawn on the floor in stacks of gold coins. This page was last modified on 8 September 2018, at 13:43.